Cormac Enright, Earl of Bellin, the “Irish Murderer,” is waiting to be hanged for a murder he did not commit when a visiting clergyman offers to help him escape. Not knowing whether the offer is genuine or a trap, Mac decides he has nothing to lose and follows the cleric. When the Reverend Kinnion is shot, Mac escapes. The clergyman identified Richard Davidson as the man whose guilty conscience had pushed him to help Mac escape his unjust sentence. Mac is willing to risk everything to find out why Davidson gave the false eye-witness testimony that led to Mac’s arrest and conviction. He ignores the instructions he has been given to leave Scotland and instead heads for Kenmore, Kinnion’s village in search of information on Davidson. Sabrina Davidson, daughter of Magistrate Richard Davidson, niece of the Earl of Tay, and cousin to Lady Aileen Davidson (The Bride Says No) and Lady Tara Davidson (The Bride Says Maybe), is a twenty-nine-year-old spinster and dutiful daughter with a reputation for seriousness, sagacity, and charitable works. Confident that her father is too devoted to the memory of her late mother to remarry, she expects to serve as his hostess and secretary and maintain her respected place in village society. Her confidence is shaken when she learns that her father plans to marry the Widow Bossley, a “robust woman of relatively good looks and lax morals.” Sabrina will soon discover that the Widow Bossley is only one of the secrets her father has been keeping. Angry and wounded by the news of her father’s plans, she retreats to an abandoned shepherd’s hut that had served as a refuge when she needed to escape the pressures of caring for her dying mother. Inside, she finds a critically ill man whom she manages to maneuver into her pony cart and take home so that she can treat his fever. The man is Cormac Enright. She saves his life, and, in a different sense, he saves hers. Cathy Maxwell gives readers another hero and heroine with significant flaws and places them in circumstances that foster their growth. Sabrina begins as a proud and essentially passive woman, quick to judge others and frustrated by a limited life in which no one values her intelligence and common sense. Mac has inherited an Irish title that holds little value for him. Weary of war and deeply grieved by the loss of all his family to typhus before he could reconcile with them after a decade of estrangement, he is reaping the fruit of pride, temper, and foolish choices. When Sabrina’s father disappears, they must work together to find him and the answers they need. In the process, they discover far more than they expected about one another and about themselves. The third book of Maxwell’s Brides of Wishmore series blends mystery and romance with flashes of humor. Like the two earlier books in the series, this one is a memorable book with engaging protagonists who are distinctly different from the usual. I suspect some readers will take the author to task for the first passionate scene between Sabrina and Mac, but I thought Maxwell made it work by revealing Sabrina’s character early on and by showing afterwards her comprehension of all she had risked. My only complaint concerns the last part of the book. I would like for the conclusion to have been a bit longer. I wanted to see more of the transformation of Sabrina and Mac’s lives. Although the thematic connections in this series are strong, this third book is connected only loosely to the earlier two in terms of plot. Thus, The Groom Says Yes can be read easily as a standalone. However, I recommend all three books. 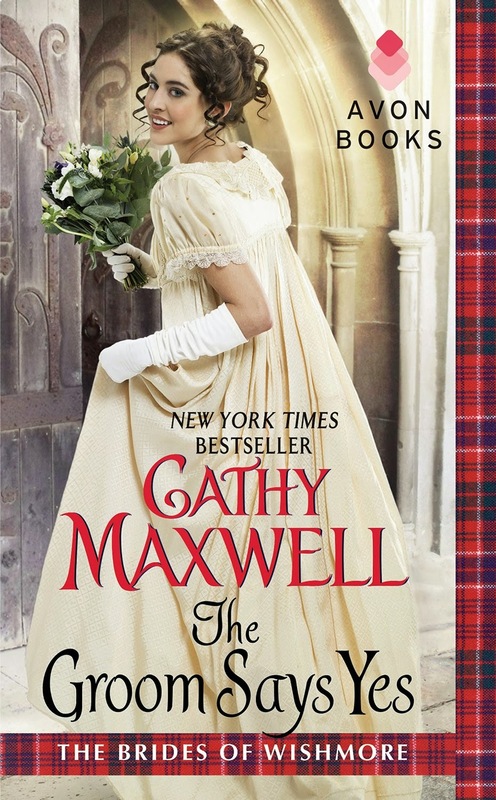 I have found the series refreshing to a somewhat jaded palate, and I am eager to see what Cathy Maxwell has next for her readers. I really enjoyed "The Bride Says No" and "The Bride Says Maybe" and have eagerly awaited "The Groom Says Yes." The first two books were very cleverly written and humorous so I'm betting the last one will be fabulous! Cathy Maxwell has certainly proven herself to be a terrific author. I agree, Connie. She is a terrific author. I've been reading her for years. Really looking forward to this one! This looks like a great read. I love Cathy Maxwell's books. Thanks for the recommendation. I absolutely LOVE the cover! I enjoy her books and this one sounds like another wonderful read! I have been waiting for this 3rd book to come out, so I can read all 3 together. This sounds a little intense! Thanks for the review! I do enjoy her books, but haven't read one in a while. This series sounds like one I will enjoy. It is always refreshing to see characters who realize they and life aren't what they thought it was. Whether this destroys them or makes them transform into something stronger is what makes for an interesting story. I prefer to read a series in order, but it is tempting to read this one first.